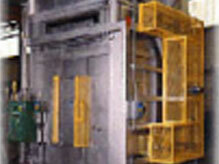 The photo is from a POLYMER WEB HEAT TREATING OVEN. This 1000°F (±5°F total uniformity) oven uses precision mechanicals, and low impingement airflow, to uniformly alter the properties of continuous polymer webbing, without disturbing the microfinish of the thin (.0005 inch-.01 inch thick) electronics industry component. Provided with heavy-duty 16 gauge stainless steel internal construction, it is designed for durability. Adjustable nozzles at both top and bottom provide superior uniformity.